Into the Storm isn’t worth watching once, let alone over and over again. If you’re looking for a good, exciting movie for a Saturday night on the couch, do yourself a favor and choose Twister instead. Wanna make a movie about tornadoes? Take some gung ho storm chaser, throw in a meteorologist doing "research", add a dash of "The Mother of All Tornadoes" and you have the formula for the makings of a great movie. And it was…1996's Blockbuster, Twister. Now, Warner Bros. has attempted to update it with Into The Storm, out on Blu-ray and DVD on November 18, 2014. Into The Storm tells the stories of Pete (Matt Walsh; Ted),] the tornado chaser, Allison (Sarah Wayne Callies; The Walking Dead) the meteorologist working the facts instead of instincts, Gary (Richard Armitage; The Hobbit: An Unexpected Journey), as the assistant principal who has lost his connection to his sons, played by Max Deacon (Hatfield and McCoys) as Donnie and Nathan Kress (iCarly) as Trey. They all end up in the town of Silverton either by living there or by chasing tornadoes and discover a massive storm system has converged on the small town. Into The Storm attempts to modernize Twister and does it poorly. The CGI looks older than those from 1996 and distracts the viewer from any sort of plot or character development, not that there is much. While Twister had great characters, good plot and build up to intense scenes, Into The Storm has a boring story and cliché ideas which doesn't hold the viewer's interest. The acting is good, but not spectacular, which is fine because the script is boring. Callies adds some sensitivity to the plot and Kress is admirable as the younger brother. The rest of the cast is simply okay and no one actor stands out more than any other. While the 1080p video shows everything in sharp picture it doesn't help the poor CGI (infact it enhances it). The DTS-HD Audio 5.1 is crisp, but does nothing to enhance the excitement one would expect from a tornado. The extras include three segments. One is a lesson about the different types of tornado funnels and how the crew attempted, poorly, to recreate them for the film. The second segment is a boring look at how the production and cast attempted to simulate extreme weather conditions. The final, and most interesting segment, is one about the ultimate storm chasing vehicle, Titus, which is modeled after a real life "tank". The parts of the extras that included interviews with real life storm chasers, and their actual footage of tornadoes, was the most exciting part of the entire Blu-ray. 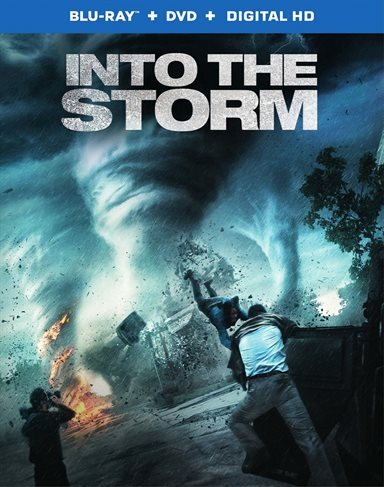 Download Into The Storm from the iTunes Store in Digial HD. For more information about Into The Storm visit the FlickDirect Movie Database.